The Challenger Deep is the deepest known point in the Earth's seabed hydrosphere (the oceans), with a depth of 10,898 to 10,916 m (35,755 to 35,814 ft) by direct measurement from submersibles and slightly more by sonar bathymetry. It is located in the Pacific Ocean, at the southern end of the Mariana Trench near the Mariana Islands group. The Challenger Deep is a relatively small slot-shaped depression in the bottom of a considerably larger crescent-shaped oceanic trench, which itself is an unusually deep feature in the ocean floor. The Challenger Deep's bottom is about 11 km (7 mi) long and 1.6 km (1 mi) wide, with gently sloping sides. The closest land to the Challenger Deep is Fais Island (one of the outer islands of Yap), 287 km (178 mi) southwest, and Guam, 304 km (189 mi) to the northeast. It is located in the ocean territory of the Federated States of Micronesia, 1.6 km (1 mi) from its border with ocean territory associated with Guam. A 2014 study by Gardner et al. concludes that with the best of 2010 multibeam echosounder technologies a depth uncertainty of ±25 m (82 ft) (95% confidence level) on nine degrees of freedom and a positional uncertainty of ±20 to 25 m (66 to 82 ft) remains. The deepest point and its location recorded in the 2010 sonar mapping conducted by the US Center for Coastal & Ocean Mapping/Joint Hydrographic Center (CCOM/JHC) aboard USNS Sumner is 10,984 m (36,037 ft) at 11°19′48″N 142°11′57″E﻿ / ﻿11.329903°N 142.199305°E﻿ / 11.329903; 142.199305 (11°19′47.650″N 142°11′57.498″E﻿ / ﻿11.32990278°N 142.19930500°E﻿ / 11.32990278; 142.19930500). In November 2016 sonar mapping of the Challenger Deep area was conducted by the Royal Netherlands Institute for Sea Research (NIOZ)/GEOMAR Helmholtz Centre for Ocean Research Kiel aboard RV Sonne. Using a Kongsberg Maritime EM 122 multibeam echosounder system coupled to positioning equipment that can determine latitude and longitude the team determined that the Challenger Deep has a maximum depth of 10,925 m (35,843 ft) at 11°19′57″N 142°12′07″E﻿ / ﻿11.332417°N 142.20205°E﻿ / 11.332417; 142.20205 (11°19.945′N 142°12.123′E﻿ / ﻿11.332417°N 142.202050°E﻿ / 11.332417; 142.202050), with an estimated depth uncertainty of ±12 m (39 ft) (68% confidence level). The horizontal position of the grid point has an uncertainty of ±50 to 100 m (164 to 328 ft), depending on along-track or across-track direction. This depth (59 m (194 ft)) and position (about 410 m (1,345 ft) to the northeast) measurements differ significantly from the deepest point determined by the Gardner et al. (2014) study. The high water pressure at this depth makes designing and operating exploratory craft difficult. Only four descents have ever been achieved. 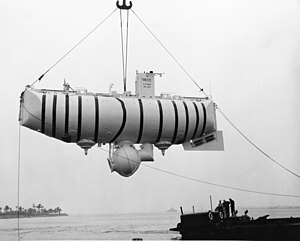 The first descent by any vehicle was by the manned bathyscaphe Trieste in 1960. This was followed by the unmanned ROVs Kaikō in 1995 and Nereus in 2009. In March 2012 a manned solo descent was made by film director James Cameron in the deep-submergence vehicle Deepsea Challenger. Over many years, the search for the point of maximum depth has involved many different vessels. The Challenger expedition (December 1872 – May 1876) first sounded the depths now known as the Challenger Deep. This first sounding was made on 23 March 1875 at station 225. The reported depth was 4,475 fathoms (26,850 ft; 8,184 m) at 11°24′N 143°16′E﻿ / ﻿11.400°N 143.267°E﻿ / 11.400; 143.267, based on two separate soundings. A 1912 book, The Depths of the Ocean by Sir John Murray, records the depth of the Challenger Deep as 31,614 ft (9,636 m), reporting the sounding taken by the converted navy collier USS Nero in 1899. Murray was one of the expedition scientists. In 1951, about 75 years after its original discovery, the entire Mariana Trench was surveyed by a second Royal Navy vessel, captained by George Stephen Ritchie (later Rear Admiral Ritchie); this vessel was also named HMS Challenger, after the original expedition ship. This survey recorded the deepest part of the trench using echo sounding, a more precise and easier way to measure depth than the sounding equipment and drag lines used in the original expedition. A depth of 5,960 fathoms (35,760 ft; 10,900 m) was measured at 11°19′N 142°15′E﻿ / ﻿11.317°N 142.250°E﻿ / 11.317; 142.250. Research vessel Vityaz in Kaliningrad "Museum of world ocean"
The maximum surveyed depth of the Challenger Deep was reported in 1957 by the Soviet Research vessel Vityaz recording a spot 11,034 metres (36,201 ft) ±50 m (164 ft) deep at 11°20.9′N 142°11.5′E﻿ / ﻿11.3483°N 142.1917°E﻿ / 11.3483; 142.1917. It was dubbed the Mariana Hollow and is listed in many reference sources, including the Encyclopædia Britannica, articles in National Geographic and on maps. The pressure at this depth is approximately 1,099 times atmospheric pressure, or 111 MPa (16,099 psi). In 1959, the US Navy research vessel RV Stranger using bomb-sounding surveyed a maximum depth of 10,915 m (35,810 ft) ±10 m (33 ft) at 11°20.0′N 142°11.8′E﻿ / ﻿11.3333°N 142.1967°E﻿ / 11.3333; 142.1967. In 1962, the US Navy research vessel RV Spencer F. Baird using a frequency-controlled depth recorder surveyed a maximum depth of 10,915 m (35,810 ft) ±10 m (33 ft) at 11°20.0′N 142°11.8′E﻿ / ﻿11.3333°N 142.1967°E﻿ / 11.3333; 142.1967. In 1975 and 1980, the US Navy research vessel RV Thomas Washington using a precision depth recorder with satellite positioning surveyed a maximum depth of 10,915 m (35,810 ft) ±10 m (33 ft) at 11°20.0′N 142°11.8′E﻿ / ﻿11.3333°N 142.1967°E﻿ / 11.3333; 142.1967. In 1984, the survey vessel Takuyo from the Hydrographic Department of Japan, used a narrow, multibeam echo sounder to take a measurement of 10,924 m (35,840 ft) ±10 m (33 ft) at 11°22.4′N 142°35.5′E﻿ / ﻿11.3733°N 142.5917°E﻿ / 11.3733; 142.5917. In 1998, a regional bathymetric survey of the Challenger Deep was conducted by the Deep Sea Research Vessel RV Kairei, from the Japan Agency for Marine-Earth Science and Technology, using a SeaBeam 2112 multibeam echosounder. The regional bathymetric map made from the data obtained in 1998 shows that the greatest depths in the eastern, central, and western depressions are 10,922 m (35,833 ft) ±74 m (243 ft), 10,898 m (35,755 ft) ±62 m (203 ft), and 10,908 m (35,787 ft) ±36 m (118 ft), respectively, making the eastern depression the deepest of the three. In 1999 and 2002, Kairei revisited the Challenger Deep. The cross track survey in the 1999 Kairei cruise shows that the greatest depths in the eastern, central, and western depressions are 10,920 m (35,827 ft) ±10 m (33 ft), 10,894 m (35,741 ft) ±14 m (46 ft), and 10,907 m (35,784 ft) ±13 m (43 ft), respectively, which supports the results of the 1998 survey. The detailed grid survey in 2002 showed that the deepest site is located in the eastern part of the eastern depression around 11°22.260′N 142°35.589′E﻿ / ﻿11.371000°N 142.593150°E﻿ / 11.371000; 142.593150, with a depth of 10,920 m (35,827 ft) ±5 m (16 ft), about 290 m (950 ft) southeast of the deepest site determined by the survey vessel Takuyo in 1984 and about 240 m (790 ft) east of the deepest place determined by the 1998 Kairei survey. On 1 June 2009, sonar mapping of the Challenger Deep by the Kongsberg Simrad EM 120 sonar multibeam bathymetry system for deep water (300 – 11,000 metres) mapping aboard RV Kilo Moana (mothership of the underwater vehicle Nereus) indicated a depth of 10,971 m (35,994 ft). The sonar system uses phase and amplitude bottom detection, which is capable of an accuracy of 0.2% to 0.5% of water depth across the entire swath. In 2014 the multibeam bathymetry data of this sonar mapping have yet to be publicly released, so the data are not available for comparisons with other soundings. On 7 October 2010, further sonar mapping of the Challenger Deep area was conducted by the US Center for Coastal & Ocean Mapping/Joint Hydrographic Center (CCOM/JHC) aboard USNS Sumner. The results were reported in December 2011 at the annual American Geophysical Union fall meeting. Using a Kongsberg Maritime EM 122 multibeam echosounder system coupled to positioning equipment that can determine latitude and longitude up to 50 cm (20 in) accuracy, from thousands of individual soundings around the deepest part the CCOM/JHC team preliminary determined that the Challenger Deep has a maximum depth of 10,994 m (36,070 ft) at 11°19′35″N 142°11′14″E﻿ / ﻿11.326344°N 142.187248°E﻿ / 11.326344; 142.187248, with an estimated vertical uncertainty of ±40 m (131 ft) at two standard deviations (≈ 95.4%) confidence level. A secondary deep with a depth of 10,951 m (35,928 ft) was located at approximately 23.75 nmi (44.0 km) to the east at 11°22′11″N 142°35′19″E﻿ / ﻿11.369639°N 142.588582°E﻿ / 11.369639; 142.588582 in the Mariana Trench. In November 2016 sonar mapping of the Challenger Deep area was conducted by the Royal Netherlands Institute for Sea Research (NIOZ)/GEOMAR Helmholtz Centre for Ocean Research Kiel aboard RV Sonne. The results were reported in 2017. Using a Kongsberg Maritime EM 122 multibeam echosounder system coupled to positioning equipment that can determine latitude and longitude the team determined that the Challenger Deep has a maximum depth of 10,925 m (35,843 ft) at 11°19.945′N 142°12.123′E﻿ / ﻿11.332417°N 142.202050°E﻿ / 11.332417; 142.202050 (11°19′57″N 142°12′07″E﻿ / ﻿11.332417°N 142.20205°E﻿ / 11.332417; 142.20205), with an estimated vertical uncertainty of ±12 m (39 ft) at one standard deviation (≈ 68.3%) confidence level. The horizontal position of the grid point has an uncertainty of ±50 to 100 m (164 to 328 ft), depending on along-track or across-track direction. This depth (59 m (194 ft)) and position (about 410 m (1,345 ft) to the northeast) measurements differ significantly from the deepest point determined by the Gardner et al. (2014) study. In 2014, a study was conducted regarding the determination of the depth and location of the Challenger Deep based on data collected previous to and during the 2010 sonar mapping of the Mariana Trench with a Kongsberg Maritime EM 122 multibeam echosounder system aboard USNS Sumner. This study by James. V. Gardner et al. of the Center for Coastal & Ocean Mapping-Joint Hydrographic Center (CCOM/JHC), Chase Ocean Engineering Laboratory of the University of New Hampshire splits the measurement attempt history into three main groups: early single-beam echo sounders (1950s-1970s), early multibeam echo sounders (1980s - 21st century), and modern (i.e., post-GPS, high-resolution) multibeam echo sounders. Taking uncertainties in depth measurements and position estimation into account the raw data of the 2010 bathymetry of the Challenger Deep vicinity consisting of 2,051,371 soundings from eight survey lines was analyzed. The study concludes that with the best of 2010 multibeam echosounder technologies after the analysis a depth uncertainty of ±25 m (82 ft) (95% confidence level) on 9 degrees of freedom and a positional uncertainty of ±20 to 25 m (66 to 82 ft) (2drms) remain and the location of the deepest depth recorded in the 2010 mapping is 10,984 m (36,037 ft) at 11°19′48″N 142°11′57″E﻿ / ﻿11.329903°N 142.199305°E﻿ / 11.329903; 142.199305. The depth measurement uncertainty is a composite of measured uncertainties in the spatial variations in sound-speed through the water volume, the ray-tracing and bottom-detection algorithms of the multibeam system, the accuracies and calibration of the motion sensor and navigation systems, estimates of spherical spreading, attenuation throughout the water volume, and so forth. The 2009 and 2010 maximal depths were not confirmed by the series of dives Nereus made to the bottom during an expedition in May–June 2009. The direct descent measurements by the four expeditions which have reported from the bottom, have fixed depths in a narrow range from 10,916 m (35,814 ft) (Trieste) to 10,911 m (35,797 ft) (Kaikō), to 10,902 m (35,768 ft) (Nereus) to 10,898 m (35,755 ft) (Deepsea Challenger) Although an attempt was made to correlate locations, it could not be absolutely certain that Nereus (or the other descents) reached exactly the same points found to be maximally deep by the sonar/echo sounders of previous mapping expeditions, even though one of these echo soundings was made by Nereus' mothership. Bathyscaphe Trieste. The spherical crew cabin is attached to the underside of a tank filled with gasoline (which is incompressible), which serves as a float giving the craft buoyancy. 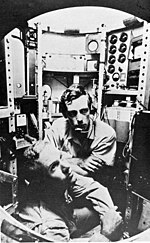 Lt. Don Walsh, USN (bottom) and Jacques Piccard (center) in the Trieste. On 23 January 1960, the Swiss-designed Trieste, originally built in Italy and acquired by the U.S. Navy, descended to the ocean floor in the trench manned by Jacques Piccard (who co-designed the submersible along with his father, Auguste Piccard) and USN Lieutenant Don Walsh. Their crew compartment was inside a spherical pressure vessel, which was a heavy-duty replacement (of the Italian original) built by Krupp Steel Works of Essen, Germany. Their descent took almost five hours and the two men spent barely twenty minutes on the ocean floor before undertaking the three-hour-and-fifteen-minute ascent. Their early departure from the ocean floor was due to their concern over a crack in the outer window caused by the temperature differences during their descent. The measured depth at the bottom was measured with a manometer at 10,916 m (35,814 ft) ±5 m (16 ft). On 26 March 2012 (local time), Canadian film director James Cameron made a solo manned descent in the DSV Deepsea Challenger to the bottom of the Challenger Deep. At approximately 05:15 ChST on 26 March (19:15 UTC on 25 March), the descent began. At 07:52 ChST (21:52 UTC), Deepsea Challenger arrived at the bottom. The descent lasted 2 hours and 36 minutes and the recorded depth was 10,898.4 metres (35,756 ft) when Deepsea Challenger touched down. Cameron had planned to spend about six hours near the ocean floor exploring but decided to start the ascent to the surface after only 2 hours and 34 minutes. The time on the bottom was shortened because a hydraulic fluid leak in the lines controlling the manipulator arm obscured the visibility out the only viewing port. It also caused the loss of the submersible's starboard thrusters. At around 12:00 ChST (02:00 UTC on 26 March), the Deepsea Challenger website says the sub resurfaced after a 90-minute ascent, although Paul Allen's tweets indicate the ascent took only about 67 minutes. During a post-dive press conference Cameron said: "I landed on a very soft, almost gelatinous flat plain. Once I got my bearings, I drove across it for quite a distance ... and finally worked my way up the slope." The whole time, Cameron said, he didn't see any fish, or any living creatures more than an inch (2.54 cm) long: "The only free swimmers I saw were small amphipods"—shrimplike bottom-feeders. DOER Marine, a San Francisco Bay Area based marine technology company established in 1992, that is developing a vehicle, Deepsearch (and Ocean Explorer HOV Unlimited), with some support from Google's Eric Schmidt with which a crew of two or three will take 90 minutes to reach the seabed, as the program Deep Search. On 24 March 1995, the Japanese robotic deep-sea probe Kaikō broke the depth record for unmanned probes when it reached close to the surveyed bottom of the Challenger Deep. Created by the Japan Agency for Marine-Earth Science and Technology (JAMSTEC), it was one of the few unmanned deep-sea probes in operation that could dive deeper than 6,000 metres (20,000 ft). The manometer measured depth of 10,911 m (35,797 ft) ±3 m (10 ft) at 11°22.39′N 142°35.54′E﻿ / ﻿11.37317°N 142.59233°E﻿ / 11.37317; 142.59233 for the Challenger Deep is believed to be the most accurate measurement taken yet. Kaikō also collected sediment cores containing marine organisms from the bottom of the deep. Kaikō made many unmanned descents to the Mariana Trench during three expeditions in 1995, 1996 and 1998. The greatest depth measured by Kaikō in 1996 was 10,898 m (35,755 ft) at 11°22.10′N 142°25.85′E﻿ / ﻿11.36833°N 142.43083°E﻿ / 11.36833; 142.43083 and in 1998 10,907 m (35,784 ft) at 11°22.95′N 142°12.42′E﻿ / ﻿11.38250°N 142.20700°E﻿ / 11.38250; 142.20700. It was lost at sea off Shikoku Island during Typhoon Chan-Hom on 29 May 2003. On 31 May 2009 the United States sent the Nereus hybrid remotely operated vehicle (HROV) to the Challenger Deep. 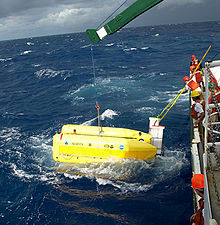 Nereus thus became the first vehicle to reach the Mariana Trench since 1998 and the deepest-diving vehicle then in operation. Project manager and developer Andy Bowen heralded the achievement as "the start of a new era in ocean exploration". Nereus, unlike Kaikō, did not need to be powered or controlled by a cable connected to a ship on the ocean surface. Nereus spent over 10 hours at the bottom of the Challenger Deep and measured a depth of 10,902 m (35,768 ft) at 11°22.1′N 142°35.4′E﻿ / ﻿11.3683°N 142.5900°E﻿ / 11.3683; 142.5900, while sending live video and data back to its mothership RV Kilo Moana at the surface and collecting geological and biological samples from the Challenger Deep bottom with its manipulator arm for further scientific analysis. The Nereus was operated by the Woods Hole Oceanographic Institution. It was lost on May 10, 2014 while conducting a dive at 9,900 metres (32,500 ft) in depth in the Kermadec Trench. On 23 May 2016 the Chinese submersible Haidou-1 dove to a depth of 10,767 m (35,325 ft) in the Mariana Trench. This autonomous and remotely operated vehicle has a design depth of 11,000 m (36,089 ft). The summary report of the HMS Challenger expedition lists radiolaria from the two dredged samples taken when the Challenger Deep was first discovered. These (Nassellaria and Spumellaria) were reported in the Report on Radiolaria (1887) written by Ernst Haeckel. On their 1960 descent, the crew of the Trieste noted that the floor consisted of diatomaceous ooze and reported observing "some type of flatfish" lying on the seabed. And as we were settling this final fathom, I saw a wonderful thing. Lying on the bottom just beneath us was some type of flatfish, resembling a sole, about 1 foot [30 cm] long and 6 inches [15 cm] across. Even as I saw him, his two round eyes on top of his head spied us – a monster of steel – invading his silent realm. Eyes? Why should he have eyes? Merely to see phosphorescence? The floodlight that bathed him was the first real light ever to enter this hadal realm. Here, in an instant, was the answer that biologists had asked for the decades. Could life exist in the greatest depths of the ocean? It could! And not only that, here apparently, was a true, bony teleost fish, not a primitive ray or elasmobranch. Yes, a highly evolved vertebrate, in time's arrow very close to man himself. Slowly, extremely slowly, this flatfish swam away. Moving along the bottom, partly in the ooze and partly in the water, he disappeared into his night. Slowly too – perhaps everything is slow at the bottom of the sea – Walsh and I shook hands. Many marine biologists are now skeptical of this supposed sighting, and it is suggested that the creature may instead have been a sea cucumber. The video camera on board the Kaiko probe spotted a sea cucumber, a scale worm and a shrimp at the bottom. At the bottom of the Challenger deep, the Nereus probe spotted one polychaete worm (a multi-legged predator) about an inch long. An analysis of the sediment samples collected by Kaiko found large numbers of simple organisms at 10,900 m (35,800 ft). While similar lifeforms have been known to exist in shallower ocean trenches (> 7,000 m) and on the abyssal plain, the lifeforms discovered in the Challenger Deep possibly represent taxa distinct from those in shallower ecosystems. Most of the organisms collected were simple, soft-shelled foraminifera (432 species according to National Geographic), with four of the others representing species of the complex, multi-chambered genera Leptohalysis and Reophax. Eighty-five percent of the specimens were organic, soft-shelled allogromiids, which is unusual compared to samples of sediment-dwelling organisms from other deep-sea environments, where the percentage of organic-walled foraminifera ranges from 5% to 20%. As small organisms with hard, calcareous shells have trouble growing at extreme depths because of the high solubility of calcium carbonate in the pressurized water, scientists theorize that the preponderance of soft-shelled organisms in the Challenger Deep may have resulted from the typical biosphere present when the Challenger Deep was shallower than it is now. Over the course of six to nine million years, as the Challenger Deep grew to its present depth, many of the species present in the sediment died out or were unable to adapt to the increasing water pressure and changing environment. The species that survived the change in depth were the ancestors of the Challenger Deep's current denizens. On 17 March 2013, researchers reported data that suggested microbial life forms thrive in the Challenger Deep. Other researchers reported related studies that microbes thrive inside rocks up to 1,900 ft (579 m) below the sea floor under 8,500 ft (2,591 m) of ocean off the coast of the northwestern United States. According to one of the researchers, "You can find microbes everywhere – they're extremely adaptable to conditions, and survive wherever they are." ^ All Things Considered (9 March 2012). "Diving Back to the Bottom of the Mariana Trench". NPR. Retrieved 26 March 2012. ^ a b c "IHO-IOC GEBCO Gazetteer of Undersea Feature Names, August 2011 version". GEBCO. August 2011. Retrieved 20 March 2012. ^ a b c "So, How Deep Is the Mariana Trench?" (PDF). Center for Coastal & Ocean Mapping-Joint Hydrographic Center (CCOM/JHC), Chase Ocean Engineering Laboratory of the University of New Hampshire. 5 March 2014. Retrieved 20 May 2014. ^ a b van Haren, H.; Berndt, C.; Klaucke, I. (2017). "Ocean mixing in deep-sea trenches: New insights from the Challenger Deep, Mariana Trench. Deep-Sea Research, Part I. Oceanographic Research Papers, 129, 1-9" (PDF). www.vliz.be. ^ a b Christian Berndt GEOMAR Helmholtz Centre for Ocean Research Kiel (2016). "RV SONNE 252 Cruise Report / Fahrtbericht Yokohama: 05.11.2016 Nouméa: 18.12.2016" (PDF). www.portal-forschungsschiffe.de. ^ a b Berndt, Christian; Klaucke, Ingo; Wölfl, Anne-Cathrin (2018). "Bathymetry". Raw multibeam EM122 data: transits of SONNE cruise SO252 (Pacific). PANGAEA. www.pangaea.de (Data Set). PANGAEA - Data Publisher for Earth & Environmental Science. doi:10.1594/PANGAEA.896077. ^ a b Than, Ker (25 March 2012). "James Cameron Completes Record-Breaking Mariana Trench Dive". National Geographic Society. Retrieved 25 March 2012. ^ a b Broad, William J. (25 March 2012). "Filmmaker in Submarine Voyages to Bottom of Sea". New York Times. Retrieved 25 March 2012. ^ a b AP Staff (25 March 2012). "James Cameron has reached deepest spot on Earth". MSNBC. Retrieved 25 March 2012. ^ a b c d e f g h i j k Nakanishi, Masao (10 April 2011). "A precise bathymetric map of the world's deepest seafloor, Challenger Deep in the Mariana Trench" (PDF). Marine Geophysical Research. 32 (4): 455–463. Bibcode:2011MarGR..32..455N. CiteSeerX 10.1.1.453.5784. doi:10.1007/s11001-011-9134-0. Retrieved 30 March 2012. ^ "Report on the scientific results of the voyage of H.M.S. Challenger during the years of 1872-76 (page 877)". 19thcenturyscience.org. Retrieved 26 March 2012. ^ Theberge, A. (24 March 2009). "Thirty Years of Discovering the Mariana Trench". Hydro International. Retrieved 31 July 2010. ^ Page 131 of Murray's book refers to the Challenger Deep. ^ "Mariana Trench". Encyclopædia Britannica. Encyclopædia Britannica. ^ a b Akimoto; et al. (2001). "The deepest living foraminifera, Challenger Deep, Mariana Trench". Marine Micropaleontology. 42 (1–2): 95. Bibcode:2001MarMP..42...95A. doi:10.1016/S0377-8398(01)00012-3. ^ Ritchie, Steve. "The deepest depths". Archived from the original on 27 October 2007. Retrieved 4 July 2007. ^ a b "Daily Reports for R/V KILO MOANA June and July 2009". University of Hawaii Marine Center. 4 June 2009. Retrieved 4 June 2009. ^ "Inventory of Scientific Equipment aboard the R/V KILO MOANA". University of Hawaii Marine Center. 4 June 2009. Retrieved 4 June 2009. ^ Armstrong, Andrew A. (22 December 2011). "Cruise Report - UNH-CCOM/JHC Technical Report 11-002" (PDF). NOAA/UNH Joint Hydrographic Center University of New Hampshire. p. 12. Retrieved 1 May 2012. ^ "EM 122 sonar multibeam bathymetry system brochure" (PDF). kongsberg.com. ^ Press Release, Office of Naval Research (1 February 1960). "Research Vessels: Submersibles – Trieste". United States Navy. Archived from the original on 18 April 2002. Retrieved 16 May 2010. ^ Prince, Rosa (25 March 2012). "James Cameron becomes first solo diver to visit Earth's deepest point". The Telegraph. Retrieved 26 March 2012. ^ National Geographic (25 March 2012). "James Cameron Begins Descent to Ocean's Deepest Point". National Geographic Society. Retrieved 25 March 2012. ^ National Geographic (25 March 2012). "James Cameron Now at Ocean's Deepest Point". National Geographic Society. Retrieved 25 March 2012. ^ National Geographic (26 March 2012). "Cameron's Historic Dive Cut Short by Leak; Few Signs of Life Seen". National Geographic Society. Retrieved 26 March 2012. ^ National Geographic (28 March 2012). "Cameron's Historic Dive Cut Short by Leak; Few Signs of Life Seen". National Geographic Society. Retrieved 28 March 2012. ^ www.deepseachallenge.com (25 March 2012). "We Just Did the Impossible". www.deepseachallenge.com. Archived from the original on 29 March 2012. Retrieved 26 March 2012. ^ https://twitter.com/PaulGAllen (27 March 2012). "Paul Allen Tweets from Challenger Deep". twitter.com/PaulGAllen. Retrieved 27 March 2012. ^ National Geographic (27 March 2012). "James Cameron on Earth's Deepest Spot: Desolate, Lunar-Like". National Geographic Society. Retrieved 27 March 2012. ^ "Race to the bottom of the ocean". BBC News. 22 February 2012. Retrieved 22 March 2012. ^ "Triton 36,000 Full Ocean Depth Submersible". Triton Submarines. Archived from the original on 29 March 2012. Retrieved 25 March 2012. ^ "Virgin Oceanic". Virgin Oceanic. Retrieved 1 March 2012. ^ "Deep Search". DOER Marine. Retrieved 25 March 2012. ^ "Kaiko 7000II". Japan Agency for Marine-Earth Science and Technology. Retrieved 26 March 2012. ^ "Revisiting the Challenger Deep using the ROV Kaiko" (PDF). Winter 2009 Volume 43, Number 5. Retrieved 15 December 2016. ^ a b c d "Robot sub reaches deepest ocean". BBC News. 3 June 2009. Retrieved 3 June 2009. ^ "'Nereus' reaches deepest part of the ocean". physorg.com. 2 June 2009. Retrieved 2 June 2009. ^ "Daily Reports for R/V KILO MOANA April and May 2009". University of Hawaii Marine Center. 31 May 2009. Retrieved 31 May 2009. ^ "Hybrid Remotely Operated Vehicle "Nereus" Reaches Deepest Part of the Ocean". Woods Hole Oceanographic Institution. 2 June 2009. Retrieved 2 June 2009. ^ Amos, Jonathan (12 May 2014). "Deep-sea sub 'implodes' 10km-down" – via www.bbc.com. ^ "Nitrogen experiment among breakthroughs 丨 Nation". chinadailyasia.com. ^  Archived 10 March 2011 at the Wayback Machine, entry on 23 March 1875. ^ , Report on the Radiolaria collected by H.M.S. Challenger by Ernst Haeckel. ^ Seven Miles Down: The Story of the Bathyscaph Trieste (1961) by J. Piccard and R. S. Dietz. pp. 172–174. Published by the Putnam, New York. ^ Accessed 8 Oct 2009 Archived 1996-10-27 at the Wayback Machine Geography of the ocean floor near Guam with some notes on exploration of the Challenger Deep. ^ Todo, Yuko; et al. (2005). "Simple Foraminifera Flourish at the Ocean's Deepest Point". Science. 307 (5710): 689. doi:10.1126/science.1105407. PMID 15692042. ^ Roach, John (3 February 2005). "Life Is Found Thriving at Ocean's Deepest Point". National Geographic News. ^ Roach, John. "Life If Found Thriving at Ocean's Deepest Point". National Geographic. National Geographic Society. Retrieved 17 February 2015. ^ Glud, Ronnie; Wenzhöfer, Frank; Middleboe, Mathias; Oguri, Kazumasa; Turnewitsch, Robert; Canfield, Donald E.; Kitazato, Hiroshi (17 March 2013). "High rates of microbial carbon turnover in sediments in the deepest oceanic trench on Earth". Nature Geoscience. 6 (4): 284. Bibcode:2013NatGe...6..284G. doi:10.1038/ngeo1773. Retrieved 17 March 2013. "Official press release regarding Challenger Deep operation". Archived from the original on 18 April 2002.